Tumor – The Comic – Behind the Scenes » Comics Activism Now! Home > Print Edition, Promotion	> Comics Activism Now! The thing is that these books just aren’t ordered enough. The lions share of books ordered in the direct market are from the top two publishers, and you can’t fault retailers for that. It’s a tough economy, and they need to know that every single book they order has the best chance possible to sell. But, with comics you actually have the ability to make a difference. If you let your retailer know about the books that aren’t from the big boys, but are interesting to you, then there’s a good chance that they’ll actually take a chance, because if you like something then, the idea goes, your friends who shop with you may like it too. If you take the time to just Tweet to your friends about a book you enjoyed that’s available, they can place their order, and if they enjoy it, they tell their friends. We’re a word of mouth industry, and I think a lot of us forget that sometimes. When I do a book like Tumor, I’m doing it for free. I spent a good chunk of a year working on it because I believe in it, and it’s my art. Fortunately, I’ve been able to make my art my full time job for a long time now. But, the challenges of the market remain, and without the orders it becomes very difficult for me to convince publishers to take another chance on my weird, arty genre comics. So please, I know that if you’re a member of this list it’s because you’ve enjoyed something that I’ve written. Or you’re a glutton for punishment. Either or. 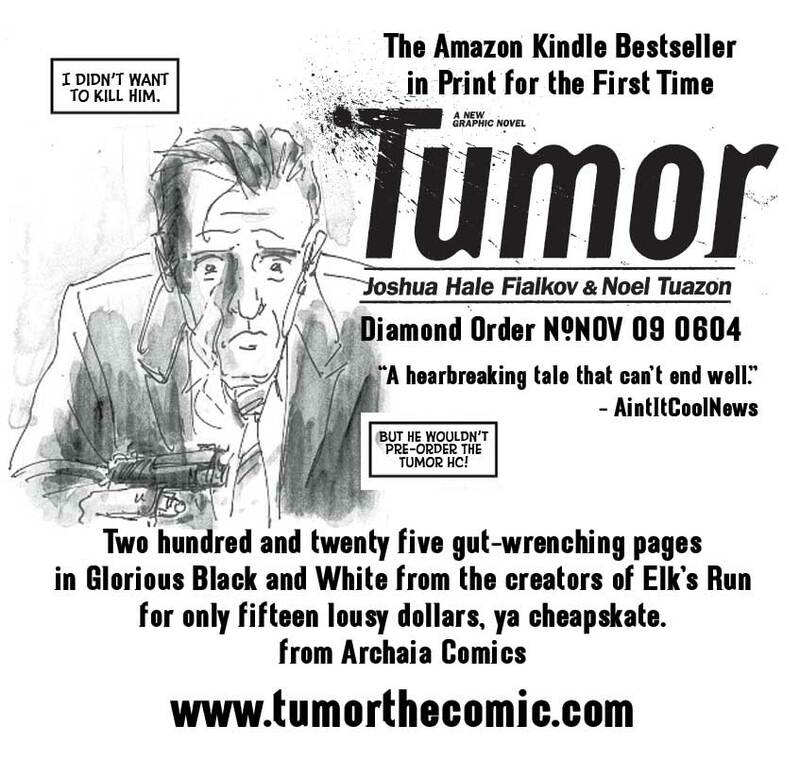 So, if you’ve enjoyed anything I’ve ever written, I’m pretty sure you’ll like Tumor as I’ve been told it’s the best book I’ve ever done. But I bet you HATE those Flash comic viewers, don’t you? Well, howsabout this. You can read the first half of the book for free in downloadable PDF format here. If you like it, please, twitter it, facebook it, e-mail it, show it to your friends, print out copies to give to your retailer. Print it out, and take it to your local retailer (which you can find here: http://comicshoplocator.com/) and ask them to pre-order the book. That’s it. Alright, let’s say you’ve read the book and don’t know why you should pay 15 bucks for a beautifully designed hard cover version. 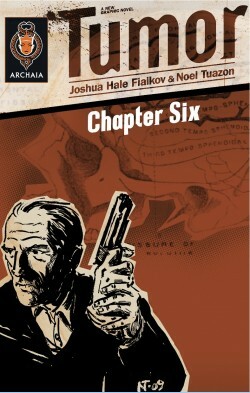 Well, there’s the beautiful introduction by crime fiction writer extraordinaire Duane Swierczynski, an original and exclusive short story about Frank and Polish’s first meetings, a long form essay on Los Angeles and it’s relationship to the book, an exclusive gallery of concept art, and much, much more. It’s 225 pages, approximately, for only fifteen bucks! Talk about your value! So, thanks for reading, and please, if you like the book, don’t make it a secret. Scream from the rooftops, and let people know that you want something different from everything else on the shelf.